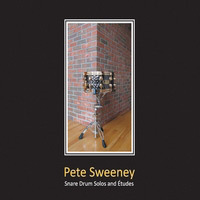 This is a recording of solo snare drumming that is based on a more modern symphonic style, rather than the typical rudimental marching tradition. I was inspired by Joe Morello to get a book of snare etudes written by Jacques Delecluse, who was the percussionist and pianist for the Paris Symphony. The etudes he wrote have become classics in the repertoire of modern percussion, and are used often as recital pieces at Julliard and Eastman. I recorded all 12 of his “Douze Etudes” on this cd, as well as pieces written by Warren Benson, Joseph Tompkins, Frank Zappa, and myself. Here are some notes on each of the individual tracks. Initially written as a drumset solo, I have modified and arranged it for solo snare drum. Measure 15 is the infamous tuplet rhythm defined in a half note triplet frame. Measure 27 and 29 have the 11 note phrase played in one beat. This is a cut-time triplet solo with a few interesting accents along the way. A 3/4 solo that is very untypical in every way. The use of asymmetrical phrases and quintuplets throughout can be clearly heard. The 6/8 classic. One of the great solos of this genre. Interesting use of quintuplets later on. 2/4 time with many quasi Swiss triplet figures. A mixed meter festival. Changing time signatures throughout. A very interesting solo in 5/8 time. This solo is over the barline in every way. This is a 2/4 solo that uses flams and drags in very difficult ways. Quite a challenge to play at the prescribed 80 bpm. This is a deceptively difficult piece for 3/8. Some strange, displaced figures throughout. This is the classic 6/8 solo that so many have performed for their percussion recitals. The figures and dynamic contrasts are really unique. This is a mixed meter solo that presents many hurdles. It starts in ¾ ,moves to 6/8, then 4/8, 5/8 and so on. A great composition. Here is a cut time piece where the suggested tempo marking is half note equals 160. The grace notes are really difficult starting in the 10th measure. The last piece of the Douze Etudes is another mixed meter masterpiece. The time signatures are changing almost constantly. This is a classic trilogy written by Warren Benson in the 1960’s. The Cretan dance is in a quick 5/4 with the snares off. The composer indicated that the drum be played in the center and near the rim to get different tonal effects. There is also the use of the “stick on stick” technique in various spots, as well as wide dynamic shifts. Here Benson composed a middle section to be performed with one stick (right hand) and one brush (left hand). The finale is a lively ¾ that makes use of another “stick on stick” technique to get a roll effect. Tompkins has composed a solo that uses triplets in 4/4 with many French rudimental influences. Lots of “studder” steps throughout. A 2/4 solo with some interesting “hiccups”. This is the classic solo from the beginning of Anthony Cirone’s book. Here is a great example of theme and variation. This is the first of my original compositions on the recording. It’s in 4/4 with a primary theme that is restated throughout, but partially obscured. I used the polyrhythm of 5:2 as the basis for much of the theme. Another original of mine, this has a mixed meter theme of 4/4, 3/4, 4/4, 2/4, 4/4, 5/4 to intentionally throw off the symmetry. The quarter note triplet is the dominant voice here. I got the idea to take snare arrangement of the Black Page #1 and play it backwards (retrograde). At moments it’s a literal retrograde, at other times it isn’t. It moves from the end to the beginning in a conventional manner with some minor adjustments.